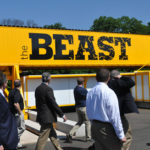 At the New Jersey Institute of Technology, winners in ASCE’s Innovation Contest resilience category showed their ideas to leaders from Mott MacDonald and ASCE staff. Pat Natale’s words hit close to home, even more than he knew. 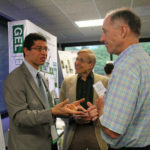 “Innovation is really great, but sometimes it sits on the shelf,” Natale, P.E., Dist.M.ASCE, told the crowd assembled for the ASCE Innovation Contest Resilience Category symposium at the New Jersey Institute of Technology in Newark, July 13. 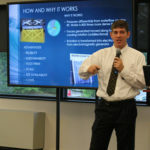 Mott MacDonald’s vice president of business strategies – ASCE’s executive director from 2002-2014 – was speaking generally about the importance of shining a light on innovative ideas, but to contest winner D. Matthew Stuart, it sounded as if Natale was addressing him directly. For a concept he developed 25 years ago, Stuart, P.E., S.E., F.SEI, F.ASCE, earned the Most Feasible Award. ASCE’s Innovation Contest allowed Stuart to take his good idea off the shelf and give it new life. Stuart’s proposal, “Improving the Resilience of Sheathed, Unbonded Monostrand Post-Tensioned Construction,” was the first to be submitted when the ASCE Innovation Contest opened last winter. Stuart’s experience reflects the exact kind of idea ASCE’s Industry Leaders Council had hoped to unearth when it launched the Innovation Contest last winter as part of the Society’s Grand Challenge strategic initiative to reduce infrastructure life-cycle costs. Winners are being honored at separate events for each of four categories, and get to present their ideas to industry leaders. Mott MacDonald sponsored and hosted the resilience category event at NJIT. 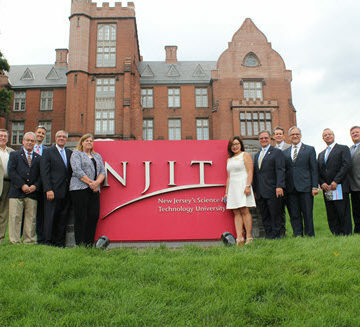 M.ASCE, attended the event at NJIT to view and gauge winners’ potential. Bringing ideas like Stuart’s to fruition requires business acumen and of course, funding. That’s where Smart City Works could be a collaborator. Contest winners at NJIT enjoyed the added advantage of being scrutinized by an audience of nearly 100 eager postgraduate, undergrad, and even some pre-college students. 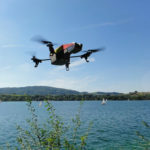 Students enjoyed the presentations, especially taking to the submittal from Jason Magalen, P.E., M.ASCE, “Rise of the Drones: How Unmanned Surveying Can Help Make Our Coasts Resilient,” which earned the resilience category’s Best Value Award. The drone technology caught the eye of Abhijit Bal, an electronic engineering student. Nick DeNichilo, P.E., F.ASCE, president and CEO of Mott MacDonald North America, enjoyed getting the students to think in terms of innovation.